Every breed, regardless of size, age or coat type, needs regular grooming for overall wellbeing and to help prevent problems. 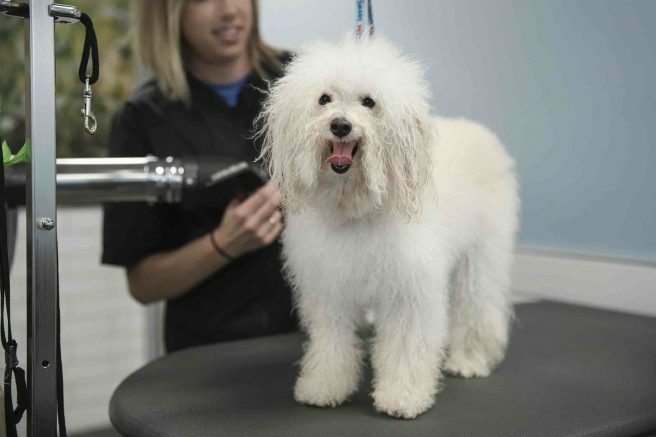 While a haircut is often the first thing that comes to mind when pet parents contemplate a visit to the groomer, those visits can involve much more than a bath and trim. It can also include spa-like skin and paw treatments, deep moisturizing shampoos and conditioners for healthy skin and a lustrous coat, de-shedding and flea or tick treatments. These treatments are all in addition to the expert clipping, shaving and nail trims you might expect. Grooming is more than an attractive hairdo; every breed, regardless of size, age or coat type, needs regular grooming for overall wellbeing and to help prevent problems such as excessive shedding, skin and paw irritation, painful mats and bad breath. For certain longer-haired breeds, more frequent grooming may be necessary. While grooming is a necessity, it may sound more pleasant to pet parents than pets, especially dogs that are new to the experience or don’t visit the groomer regularly. Freeman also recommends flagging any pre-existing conditions with your groomer beforehand. This is especially important because grooming can elicit excitement or stress in some pets and aggravate underlying health issues like heart disease. • When deciding on a groomer, look for a salon that employs safety-certified groomers who have undergone extensive hands-on grooming instruction including bathing, trimming and styling. • Be proactive in raising questions or concerns. Being transparent about your pet is best for his or her well-being as well as that of other pets and associates in the salon. • Let your pet visit the store or salon beforehand to get familiar with the smells, sounds and salon associates. • Schedule groomer visits during slower times or request an express groom where the pet stays in the salon for a shorter time period. • Prepare your pup for having his or her feet, ears and tail handled by doing these things at home and using grooming tools like combs and brushes to reduce fear of strange objects. Try holding an electric toothbrush near your dog to familiarize him or her with the humming sound and vibrations that are similar to clippers in the salon. • Limit how much food, water and treats your pet consumes before grooming, as this can contribute to upset stomachs and digestive trouble. • Ask a salon associate to recommend appropriate basic grooming tools and supplies for at-home maintenance between appointments. Find more advice for creating a safe and enjoyable grooming experience for your pet and learn about upcoming events where you can check out grooming options in your community at services.petsmart.com. Be the first to comment on "Prepare pets for better grooming visits"